Friends, this Creator’s Artistic Supply Box could be your next secret weapon to create stunning graphics. The bundle brings you a massive art-box of inspiration! It’s packed full with the best artistic tools that help you with everything you need to create stunning creative work quickly. From ready-to-use graphics to professional-grade tools, this bundle will have a massive impact upon the quality of your regular work. This bundle is the most diverse artistic collection ever! 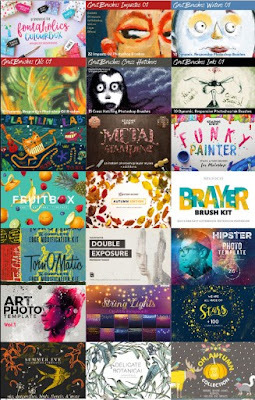 It includes a vast array of quality assets, from hand-drawn fonts, to gorgeous textures/backgrounds, patterns, scene creators, effects packs, graphics, world-class brushes and so much more from premier designers such as Nicky Laatz, Alex Dukal, Ian Barnard and Grut Brushes, to name just a few. The collection would cost you over $2000 if bought at regular price, but you’ll get them together as a bundle at a huge discount of 99% with the deal price of just $29!